There are many things to enjoy in this fantasy story including rich world-building, gorgeous writing, strong and complex characters and of course, magic! This story is told from three POVs, which while jumping from one POV to another can distract some readers, I thoroughly enjoyed. For me, this helps build a fuller and multidimensional story, which is important in not only fantasy stories, but stories filled with political and emotional agendas, determination and conflicting emotions. The world building in this story is solid, and seeing the perspectives from varying characters really helped solidify that. The characters in this story have various upbringings and experiences, and even if characters where brought up in the same environment, it is these experiences and personal beliefs that affect their hearts, minds and personal journey. Our three main characters, Zélie, Amari, and Inan, are as different to each other as they fascinating. Each has their own past and future, and when their present collides it makes for one hell of journey. Zélie has a magical and tragic past and is driven by emotion, and it is her emotion that fuels that semi-unwanted but action-packed journey. Amari is filled with purpose and strength in disguise, and Inan is an emotionally torn and misguided prince, brother and son. The relationships built in this story are certainly one of the strengths of the story – and I adored the variations of these relationships, including distrust, forced alliances and relationships built over magic and dreamscapes. I loved the complexity of the characters and their existing or budding relationships – each character is faced with moral dilemmas in forging relationships, building trust and making or retaining alliances, and it is this that I think makes a good foundation for relationships, as well as for a character’s arc. Each character has strengths and weaknesses, each one is determined to save or eradicate magic, each one is slightly misguided and each one will be faced with the situation to betray those they love in their journey to do what they think will save their kingdom. The magical element in this story is thoroughly thought out, and elaborately detailed. I love elaborate stories, however I know that richly details aspects can be off-putting to some readers. This is a book that you need to bunker down with, get totally lost in and absorb every single detail. This is the main reason I only give this story 4 stars. I was not in a personal situation where I could read this book like I like to read fantasy stories – completely immersed and read in one sitting. I had to stop and start this story, which I found distracting from the story and all the intricate detail. This of course is not a reflection on the story itself, just my ability to enjoy it. The story was quite fast paced and there were certainly more than a few twists along the way. This is a story filled with cruelty and betrayal, determination and justice – you are just never quite sure which one will out. This story also raises the question on if these things are mutually exclusive. The ending is action-packed, filled with hatred, betrayal, love and uncertainty. This book certainly ends on a cliff-hanger – it leaves so many options for the future instalments and leaves you begging to find out what happens next. 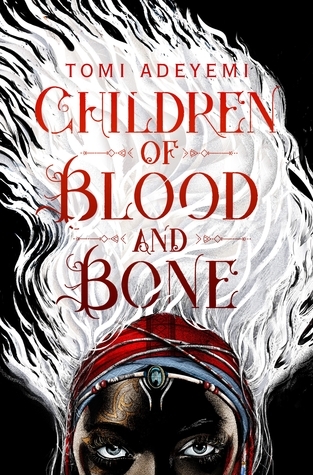 Children of Blood and Bone is filled with political agendas, hatred, trust, rebellion, friendship, violence, loyalty, oppression, blind determination and each character within the pages put absolutely everything on the line to do what they believe is right. Can oppression be crushed and magic be freed? Will freeing magic really break the chain of tyranny? Or can minds and a kingdom be remade without magical influence? And ultimately, can a new free and just future be built with so much prejudice and hurt lingering in the past?